The Story: .I found squid eggs on the air prang site and visited there for five days. I waited a lot of time because I wanted to shoot the egg hatching with the theme of "birth" but it was not easy. On the fifth day I waited for a long time and saw a noticeable yellow object. It was yellow pygmy goby. It is usually in old trees or stones, but I have never seen it with squid eggs. As soon as the little goby stopped walking around between the eggs I caught an angle. 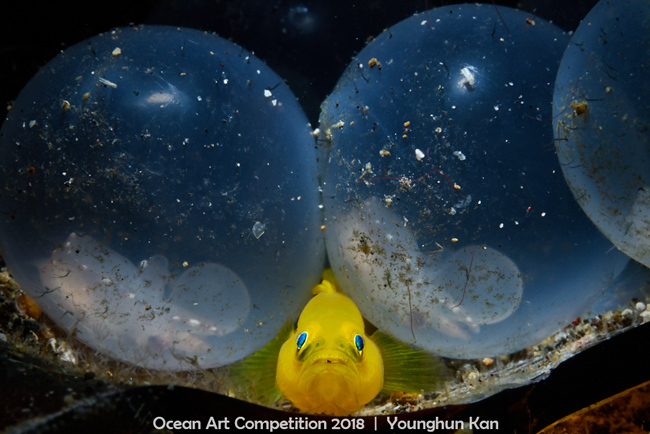 It is a rare "birth" of eggs and baby goby. I used a snoot to light the subject and the aperture to get the full depth of field.